Learn what to do and what not to do to prepare for the successful sale of your business. 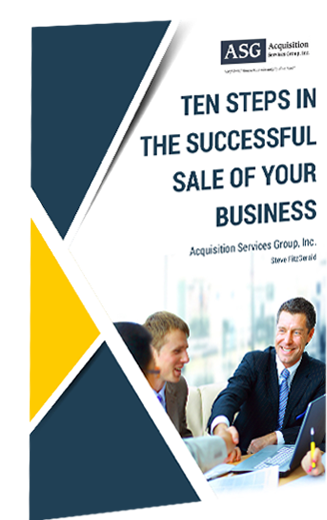 For over 40 years Acquisition Services Group (ASG) has assisted 100’s of business owner’s sell their business using a tried and true process that maximizes value and minimizes risks. How to understand the realistic value of your business and in particular how buyer’s will establish the value of a privately owned business? The importance of “Confidentiality” in the process. The first time you want your employees, vendors, and customers to learn of the sale is the day after the close of the transaction. The importance of preparation; have accurate summarized financials that focus on historical cash flow that includes owner discretionary expenses, develop a marketing database and prepare a solid non-disclosure agreement (NDA) for qualified buyers. Prepare a professional written presentation (Confidential Business Review) for delivery to qualified buyers after the NDA is executed. What to include and what NOT to include. How to structure an appropriate due diligence with your Buyer. Develop a thorough list with the Buyer and disclose everything in writing. Why due diligence is just as important to the Seller as the Buyer. If possible, have an attorney in the Seller team that can assist the Seller to understand where he/she has “risk” and has the business transaction experience to advise solutions to mitigate the risk in a manner that does not blow up the deal.